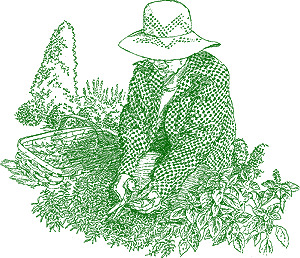 Gathering herbs from your kitchen garden for drying is one of midsummerâ€™s most pleasant tasks. Using the heat of the season to preserve some of this herbal bounty always makes one feel in tune with your garden. When sheared in midsummer, moist herb plants respond by growing bushier and more attractive; plants from which you take cuttings now will produce another harvest before frost. Drying herbs is not hard work, and you don’t need special equipment. A pinch of dried herbs can make a significant difference in stews, sauces, salads, and soups. You might also want to dry some mint or lemon verbena for teas, or prepare jars of dried herbs for thoughtful, personalized gifts. For best flavor, pick herbs when blossoms first begin to form, but before they open—this is when their volatile-oil content is highest. Wait until late morning on a sunny day, after the dew has dried. The leaves should be dry when you gather cuttings. Now’s the time to remove any grit, dust, or other residues; you won’t want to wash the herbs after they’ve dried. Long-stemmed herbs are usually fairly clean, but creeping plants like thyme may have sand or mud clinging to their leaves. Hold muddy leaves under running water for a minute or two. If they’re just dusty, you can plunge them briefly into a bucket of clean water. 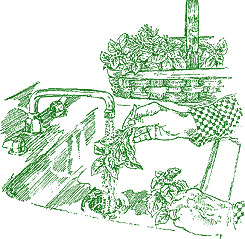 Then shake off the excess water thoroughly and pat dry with paper towels, or whirl the cuttings in a mesh basket to spin off the water. The best drying spot is a hot, dark space with good air circulation. Herbs will dry more quickly at temperatures above 80 degrees Fahrenheit. Likely places include a garage or a shady porch. Even a hot attic, where daytime temperatures might soar into the 90s or 100s, is not too hot. The heat dehydrates the leaves before they rot, darkness ensures good color retention, and moving air carries moisture away while discouraging mold formation. Twiggy or stalky herbs (such as rosemary, thyme, and dill) with small leaves that stay separate even when the stalks are bundled together may be hung in bunches from nails or wire. Working with one or two dozen stalks at a time, tie the stems tightly together with string or fasten them together with rubber bands. String may need to be tightened periodically as the stems shrink in drying, while rubber bands will continue to hold as the bundles lose bulk. 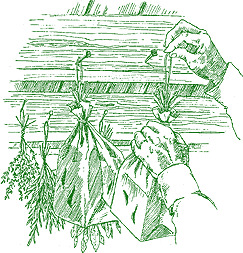 If possible, hang the bunches of herbs where air reaches them from all sides—from a rafter or ceiling hook, for example, rather than on a wall. 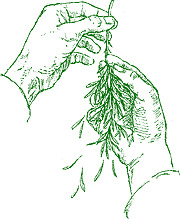 To determine whether your herbs are dry enough to pack away, roll a leaf in your fingers. It should crumble readily. If it bends but does not break when folded, or if it feels leathery, it isn’t yet dry enough. In very hot weather, small-leafed herbs like parsley and thyme should dry within a week, provided they get good air circulation. Those with larger and fleshier leaves—basil, comfrey, and the like—may take two weeks or more to dry thoroughly. Leaf stripping is a relaxing task after a day of gardening; just run you’re hands down the stalk and stems, rubbing the leaves off into a bowl on your lap. If you’re aiming for that country-herb ambience in your kitchen, save several whole herb bundles to festoon the ceiling beams. Although hanging herbs look homey and inviting, a kitchen’s warmth and occasional damp air will cause the herbs’ flavor to fade as their volatile oils evaporate. You’ll want to keep your cooking herbs under cover. Store the stripped dried leaves in tightly closed containers. I love drying my herbs! I usually have a laundry basket or box clean and ready, rinse the herbs, put down a layer of paper towels and then put the herbs (shaken a little to get rid of excess water) and then repeat the layers - towels, herbs etc. I don&#x27;t pack anything down so, I can usually get 3 layers in a small box/basket. I check them periodically and then when ready, put the leaves in mason jars.